When I was a kid the mother of a good friend’s cousin (talk about strange connections, huh?) was a belly dancer. When I was eight or nine, we had a sleep over at their house and tried on a bunch of her mom’s belly dancing stuff. I was a chubby kid and I remember being so surprised that this older woman (who was not skinny by any means) would be willing to put on a bra and skirt and dance at all. It was a strange idea- that there was a sort of dancing that didn’t have to be done only by skinny people. At the time it felt empowering, though as an adult, I realize that empowerment is complicated by institutionalized racism, sexualization of Middle Eastern women, and a whole lot of Victorian orientalist baggage. I don’t know much about actual belly dancing costumes and I’m not an expert on their history. 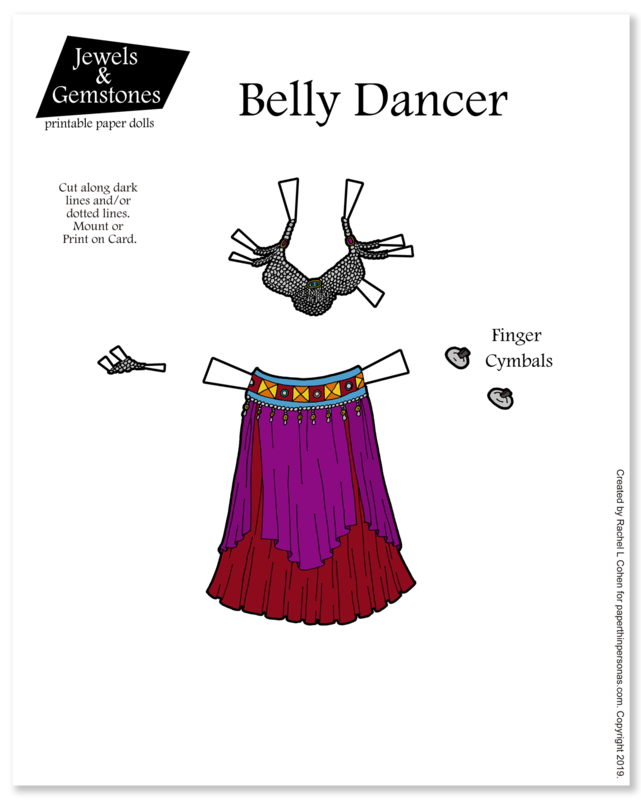 I looked up belly dancing costume sites like Belly Dance.com and Belly Dance Digs. I did want to include finger cymbals which are also called “zill”. I don’t know a lot about belly dance, but I know enough to know that there’s serious issues around appropriation, sexualization, racism, orientalist fantasy and such in the whole thing. I went back and forth about posting this outfit, but in the end, I chose to share it. Why? Because my rule has always been not to post anything with sacred religious meaning. None of my research suggested that there was religious meaning in belly dance costumes, unlike, for example, Native American regalia (which often includes holy symbols) or Catholic nun habits. In case you’ve ever wondered why I don’t have any nun paper dolls, now you know. Tomorrow on Patreon there will be a medieval inspired princess paper doll for my Patrons. Join now and you can check her out too! I want to do more dance costumes. Any suggestions? I’m thinking maybe Irish step or a classic tutu. Beautiful! I did belly dance classes when i was young adult and it really helped with my posture and gave self confidence. Their outfits are stunning. I don’t really know what people wear for dancing outside of the whole “ballroom or ballet” thing, but seeing your take on street or break dancing would be kind of cool. I know absolutely nothing about belly dancing, except that the costumes are gorgeous. Thank you for this, I love it! I think you linked to the same appropriation article twice. The “response to” link takes me to the first article instead. Eep! Good catch. It has been fixed now. This is reason 110 why I shouldn’t write blog posts after 9pm.